Wilhelm Röntgen discovered X-rays in 1895, just as the studies of crystal symmetry were being concluded. Physicists were initially uncertain of the nature of X-rays, but soon suspected (correctly) that they were waves of electromagnetic radiation—in other words, another form of light. At that time, the wave model of light—specifically, the Maxwell theory of electromagnetic radiation—was well accepted among scientists, and experiments by Charles Glover Barkla showed that X-rays exhibited phenomena associated with electromagnetic waves, including transverse polarization and spectral lines akin to those observed in the visible wavelengths. Single-slit experiments in the laboratory of Arnold Sommerfeld suggested that X-rays had a wavelength of about 1 angstrom. However, X-rays are composed of photons, and thus are not only waves of electromagnetic radiation but also exhibit particle-like properties. Albert Einstein introduced the photon concept in 1905, but it was not broadly accepted until 1922, when Arthur Compton confirmed it by the scattering of X-rays from electrons. Therefore, these particle-like properties of X-rays, such as their ionization of gases, caused William Henry Bragg to argue in 1907 that X-rays were not electromagnetic radiation. Nevertheless, Bragg's view was not broadly accepted and the observation of X-ray diffraction by Max von Laue in 1912 confirmed for most scientists that X-rays were a form of electromagnetic radiation. is the incident angle, n is any integer, and λ is the wavelength of the beam. These specific directions appear as spots on the diffraction pattern called reflections. Thus, X-ray diffraction results from an electromagnetic wave (the X-ray) impinging on a regular array of scatterers (the repeating arrangement of atoms within the crystal). As each atom of the ordered periodic array of a crystal scatters radiation, it produces around itself a set of spherical wave envelopes. Any lineup of these envelopes is the basis for a combined wave moving in the direction of the common interference tangent to those spherical wave envelopes. After some distance, the curvature of these spherical envelopes vanishes and gives rise to a straight line. The cooperative combination of these straight lines, formerly scattered wavelets, is known as diffraction. As an atom consists of a swarm of electrons about a positively charged nucleus, the nucleus can often be neglected in connection with scattering due to its relatively large mass compared to that of a single electron. Because each electron in an atom has the ability to scatter an electron, based on the above discussed mechanism, it can be said that every electron in an atom scatters x-rays. Therefore, atoms as a whole will scatter electrons to an extent that is dependent on the number of electrons orbiting the nucleus. However, the intensity of the scattered radiation varies with the direction of the incident X-ray radiation, tailing off as the angle between the directions of the scattered radiation and original x-ray beam increases. The distance between two bonded atoms is a sensitive measure of the bond strength and its bond order; thus, X-ray crystallographic studies have led to the discovery of even more exotic types of bonding in inorganic chemistry, such as metal-metal double bonds, metal-metal quadruple bonds, and three-center, two-electron bonds. X-ray crystallography—or, strictly speaking, an inelastic Compton scattering experiment—has also provided evidence for the partly covalent character of hydrogen bonds. In the field of organometallic chemistry, the X-ray structure of ferrocene initiated scientific studies of sandwich compounds, while that of Zeise's salt stimulated research into "back bonding" and metal-pi complexes. Finally, X-ray crystallography had a pioneering role in the development of supramolecular chemistry, particularly in clarifying the structures of the crown ethers and the principles of host–guest chemistry. The three-dimensional structure of penicillin, solved by Dorothy Crowfoot Hodgkin in 1945. The green, red, yellow and blue spheres represent atoms of carbon, oxygen, sulfur and nitrogen, respectively. 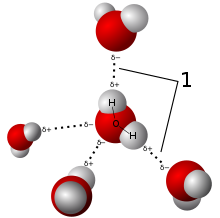 The white spheres represent hydrogen, which were determined mathematically rather than by the X-ray analysis. Protein crystals are almost always grown in solution. The most common approach is to lower the solubility of its component molecules very gradually; if this is done too quickly, the molecules will precipitate from solution, forming a useless dust or amorphous gel on the bottom of the container. Crystal growth in solution is characterized by two steps: nucleation of a microscopic crystallite (possibly having only 100 molecules), followed by growth of that crystallite, ideally to a diffraction-quality crystal. The solution conditions that favor the first step (nucleation) are not always the same conditions that favor the second step (subsequent growth). The crystallographer's goal is to identify solution conditions that favor the development of a single, large crystal, since larger crystals offer improved resolution of the molecule. Consequently, the solution conditions should disfavor the first step (nucleation) but favor the second (growth), so that only one large crystal forms per droplet. If nucleation is favored too much, a shower of small crystallites will form in the droplet, rather than one large crystal; if favored too little, no crystal will form whatsoever. Other approaches involves, crystallizing proteins under oil, where aqueous protein solutions are dispensed under liquid oil, and water evaporates through the layer of oil. Different oils have different evaporation permeabilities, therefore yielding changes in concentration rates from different percipient/protein mixture. Synchrotron radiation sources are some of the brightest lights on earth. It is the single most powerful tool available to X-ray crystallographers. It is made of X-ray beams generated in large machines called synchrotrons. These machines accelerate electrically charged particles, often electrons, to nearly the speed of light and confine them in a (roughly) circular loop using magnetic fields. Synchrotrons are generally national facilities, each with several dedicated beamlines where data is collected without interruption. Synchrotrons were originally designed for use by high-energy physicists studying subatomic particles and cosmic phenomena. The largest component of each synchrotron is its electron storage ring. This ring is actually not a perfect circle, but a many-sided polygon. At each corner of the polygon, or sector, precisely aligned magnets bend the electron stream. As the electrons' path is bent, they emit bursts of energy in the form of X-rays. A full data set may consist of hundreds of separate images taken at different orientations of the crystal. The first step is to merge and scale these various images, that is, to identify which peaks appear in two or more images (merging) and to scale the relative images so that they have a consistent intensity scale. Optimizing the intensity scale is critical because the relative intensity of the peaks is the key information from which the structure is determined. The repetitive technique of crystallographic data collection and the often high symmetry of crystalline materials cause the diffractometer to record many symmetry-equivalent reflections multiple times. This allows calculating the symmetry-related R-factor, a reliability index based upon how similar are the measured intensities of symmetry-equivalent reflections,[clarification needed] thus assessing the quality of the data. Anomalous X-ray scattering (MAD or SAD phasing) – the X-ray wavelength may be scanned past an absorption edge[when defined as?] of an atom, which changes the scattering in a known way. By recording full sets of reflections at three different wavelengths (far below, far above and in the middle of the absorption edge) one can solve for the substructure of the anomalously diffracting atoms and hence the structure of the whole molecule. The most popular method of incorporating anomalous scattering atoms into proteins is to express the protein in a methionine auxotroph (a host incapable of synthesizing methionine) in a media rich in seleno-methionine, which contains selenium atoms. A MAD experiment can then be conducted around the absorption edge, which should then yield the position of any methionine residues within the protein, providing initial phases. Structure of a protein alpha helix, with stick-figures for the covalent bonding within electron density for the crystal structure at ultra-high-resolution (0.91 Å). The density contours are in gray, the helix backbone in white, sidechains in cyan, O atoms in red, N atoms in blue, and hydrogen bonds as green dotted lines. 3D depiction of electron density (blue) of a ligand (orange) bound to a binding site in a protein (yellow). The electron density is obtained from experimental data, and the ligand is modeled into this electron density. The use of computational methods for the powder X-ray diffraction data analysis is now generalized. It typically compares the experimental data to the simulated diffractogram of a model structure, taking into account the instrumental parameters, and refines the structural or microstructural parameters of the model using least squares based minimization algorithm. Most available tools allowing phase identification and structural refinement are based on the Rietveld method, some of them being open and free software such as FullProf Suite, Jana2006, MAUD, Rietan, GSAS, etc. while others are available under commercials licenses such as Diffrac.Suite TOPAS, Match!, etc. Most of these tools also allow Le Bail refinement (also referred to as profile matching), that is, refinement of the cell parameters based on the Bragg peaks positions and peak profiles, without taking into account the crystallographic structure by itself. More recent tools allow the refinement of both structural and microstructural data, such as the FAULTS program included in the FullProf Suite, which allows the refinement of structures with planar defects (e.g. stacking faults, twinnings, intergrowths). Once the model of a molecule's structure has been finalized, it is often deposited in a crystallographic database such as the Cambridge Structural Database (for small molecules), the Inorganic Crystal Structure Database (ICSD) (for inorganic compounds) or the Protein Data Bank (for protein and sometimes nucleic acids). Many structures obtained in private commercial ventures to crystallize medicinally relevant proteins are not deposited in public crystallographic databases. since Isin = −Isin implies that Isin = 0. Each X-ray diffraction image represents only a slice, a spherical slice of reciprocal space, as may be seen by the Ewald sphere construction. Both kout and kin have the same length, due to the elastic scattering, since the wavelength has not changed. Therefore, they may be represented as two radial vectors in a sphere in reciprocal space, which shows the values of q that are sampled in a given diffraction image. Since there is a slight spread in the incoming wavelengths of the incoming X-ray beam, the values of|F(q)|can be measured only for q vectors located between the two spheres corresponding to those radii. Therefore, to obtain a full set of Fourier transform data, it is necessary to rotate the crystal through slightly more than 180°, or sometimes less if sufficient symmetry is present. A full 360° rotation is not needed because of a symmetry intrinsic to the Fourier transforms of real functions (such as the electron density), but "slightly more" than 180° is needed to cover all of reciprocal space within a given resolution because of the curvature of the Ewald sphere. In practice, the crystal is rocked by a small amount (0.25–1°) to incorporate reflections near the boundaries of the spherical Ewald's shells. Therefore, the autocorrelation function c(r) of the electron density (also known as the Patterson function) can be computed directly from the reflection intensities, without computing the phases. In principle, this could be used to determine the crystal structure directly; however, it is difficult to realize in practice. The autocorrelation function corresponds to the distribution of vectors between atoms in the crystal; thus, a crystal of N atoms in its unit cell may have N(N − 1) peaks in its Patterson function. 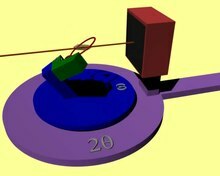 Given the inevitable errors in measuring the intensities, and the mathematical difficulties of reconstructing atomic positions from the interatomic vectors, this technique is rarely used to solve structures, except for the simplest crystals. 1915 William Henry Bragg Physics "For their services in the analysis of crystal structure by means of X-rays"
1915 William Lawrence Bragg Physics "For their services in the analysis of crystal structure by means of X-rays"
Heating or burning of bones causes recognizable changes in the bone mineral that can be detected using X-ray diffraction (XRD) techniques. During the first 15 minutes of heating at 500 °C or above, the bone crystals began to change. At higher temperatures, thickness and shape of crystals of bones appear stabilized, but when the samples were heated at a lower temperature or for a shorter period, XRD traces showed extreme changes in crystal parameters. ^ "Resonant X-ray Scattering | Shen Laboratory". arpes.stanford.edu. Retrieved 2018-04-30. ^ Steno N (1669). De solido intra solidum naturaliter contento dissertationis prodromus. Florentiae. ^ Hessel JFC (1831). Kristallometrie oder Kristallonomie und Kristallographie. Leipzig. ^ Bravais A (1850). "Mémoire sur les systèmes formés par des points distribués regulièrement sur un plan ou dans l'espace". Journal de l'Ecole Polytechnique. 19: 1. ^ Shafranovskii I I & Belov N V (1962). Paul Ewald, ed. "E. S. Fedorov" (PDF). 50 Years of X-Ray Diffraction. Springer: 351. ISBN 90-277-9029-9. ^ Schönflies A (1891). Kristallsysteme und Kristallstruktur. Leipzig. ^ Einstein A (1905). "Über einen die Erzeugung und Verwandlung des Lichtes betreffenden heuristischen Gesichtspunkt" [A Heuristic Model of the Creation and Transformation of Light]. Annalen der Physik (in German). 17 (6): 132. Bibcode:1905AnP...322..132E. doi:10.1002/andp.19053220607. . An English translation is available from Wikisource. ^ Compare: Einstein A (1909). "Über die Entwicklung unserer Anschauungen über das Wesen und die Konstitution der Strahlung" [The Development of Our Views on the Composition and Essence of Radiation]. Physikalische Zeitschrift (in German). 10: 817. . An English translation is available from Wikisource. ^ Pais A (1982). Subtle is the Lord: The Science and the Life of Albert Einstein. Oxford University Press. ISBN 0-19-853907-X. ^ Compton A (1923). "A Quantum Theory of the Scattering of X-rays by Light Elements". Phys. Rev. 21 (5): 483. Bibcode:1923PhRv...21..483C. doi:10.1103/PhysRev.21.483. ^ a b Friedrich W; Knipping P; von Laue M (1912). "Interferenz-Erscheinungen bei Röntgenstrahlen". Sitzungsberichte der Mathematisch-Physikalischen Classe der Königlich-Bayerischen Akademie der Wissenschaften zu München. 1912: 303. ^ Buerger, M. J. (August 1958). X-Ray Crystallography: An Introduction to the Investigation of Crystals by Their Diffraction of Monochromatic X-Radiation (Fourth ed.). New York: John Wiley & Sons. p. 29. ^ Meyer, Charles F. (1934). The Diffraction of light, x-rays, and material particles. Chicago, IL: University of Chicago Press. p. 279 - 341. ^ Bragg, H. W. (1913). "The reflection of x-rays by crystals". Proc. Roy. Soc. London (A). 88: 428. ^ von Laue M (1914). "Concerning the detection of x-ray interferences" (PDF). Nobel Lectures, Physics. 1901–1921. Retrieved 2009-02-18. ^ Dana ES; Ford WE (1932). A Textbook of Mineralogy (fourth ed.). New York: John Wiley & Sons. p. 28. ^ Andre Guinier (1952). X-ray Crystallographic Technology. London: Hilger and Watts LTD. p. 271. ^ Bragg WL (1912). "The Specular Reflexion of X-rays". Nature. 90 (2250): 410. Bibcode:1912Natur..90..410B. doi:10.1038/090410b0. ^ Bragg WL (1913). "The Diffraction of Short Electromagnetic Waves by a Crystal". Proceedings of the Cambridge Philosophical Society. 17: 43. ^ Bragg (1914). "Die Reflexion der Röntgenstrahlen". Jahrbuch der Radioaktivität und Elektronik. 11: 350. ^ Bragg (1913). "The Structure of Some Crystals as Indicated by their Diffraction of X-rays". Proc. R. Soc. Lond. A89 (610): 248–277. Bibcode:1913RSPSA..89..248B. doi:10.1098/rspa.1913.0083. JSTOR 93488. ^ Bragg WL; James RW; Bosanquet CH (1921). "The Intensity of Reflexion of X-rays by Rock-Salt". Phil. Mag. 41 (243): 309. doi:10.1080/14786442108636225. ^ Bragg WL; James RW; Bosanquet CH (1921). "The Intensity of Reflexion of X-rays by Rock-Salt. Part II". Phil. Mag. 42 (247): 1. doi:10.1080/14786442108633730. ^ Bragg WL; James RW; Bosanquet CH (1922). "The Distribution of Electrons around the Nucleus in the Sodium and Chlorine Atoms". Phil. Mag. 44 (261): 433. doi:10.1080/14786440908565188. ^ a b Bragg WH; Bragg WL (1913). "The structure of the diamond". Nature. 91 (2283): 557. Bibcode:1913Natur..91..557B. doi:10.1038/091557a0. ^ Bragg WH; Bragg WL (1913). "The structure of the diamond". Proc. R. Soc. Lond. A89 (610): 277. Bibcode:1913RSPSA..89..277B. doi:10.1098/rspa.1913.0084. ^ Bragg WL (1914). "The Crystalline Structure of Copper". Phil. Mag. 28 (165): 355. doi:10.1080/14786440908635219. ^ a b Bragg WL (1914). "The analysis of crystals by the X-ray spectrometer". Proc. R. Soc. Lond. A89 (613): 468. Bibcode:1914RSPSA..89..468B. doi:10.1098/rspa.1914.0015. ^ Bragg WH (1915). "The structure of the spinel group of crystals". Phil. Mag. 30 (176): 305. doi:10.1080/14786440808635400. ^ Nishikawa S (1915). "Structure of some crystals of spinel group". Proc. Tokyo Math. Phys. Soc. 8: 199. ^ Vegard L (1916). "Results of Crystal Analysis". Phil. Mag. 32 (187): 65. doi:10.1080/14786441608635544. ^ Aminoff G (1919). "Crystal Structure of Pyrochroite". Stockholm Geol. Fören. Förh. 41: 407. ^ Aminoff G (1921). "Über die Struktur des Magnesiumhydroxids". Z. Kristallogr. 56: 505. ^ Bragg WL (1920). "The crystalline structure of zinc oxide". Phil. Mag. 39 (234): 647. doi:10.1080/14786440608636079. ^ Debije P, Scherrer P (1916). "Interferenz an regellos orientierten Teilchen im Röntgenlicht I". Physikalische Zeitschrift. 17: 277. ^ Friedrich W (1913). "Eine neue Interferenzerscheinung bei Röntgenstrahlen". Physikalische Zeitschrift. 14: 317. ^ Hull AW (1917). "A New Method of X-ray Crystal Analysis". Phys. Rev. 10 (6): 661. Bibcode:1917PhRv...10..661H. doi:10.1103/PhysRev.10.661. ^ Bernal JD (1924). "The Structure of Graphite". Proc. R. Soc. Lond. A106 (740): 749–773. JSTOR 94336. ^ Hassel O; Mack H (1924). "Über die Kristallstruktur des Graphits". Zeitschrift für Physik. 25: 317. Bibcode:1924ZPhy...25..317H. doi:10.1007/BF01327534. ^ Hull AW (1917). "The Crystal Structure of Iron". Phys. Rev. 9: 84. Bibcode:1917PhRv....9...83.. doi:10.1103/PhysRev.9.83. ^ Hull AW (1917). "The Crystal Structure of Magnesium". PNAS. 3 (7): 470. Bibcode:1917PNAS....3..470H. doi:10.1073/pnas.3.7.470. PMC 1091290. ^ Black, Susan AW (2005). "Domesticating the Crystal: Sir Lawrence Bragg and the Aesthetics of "X-ray Analysis"". Configurations. 13 (2): 257. doi:10.1353/con.2007.0014. ^ a b "From Atoms To Patterns". Wellcome Collection. Archived from the original on September 7, 2013. Retrieved 17 October 2013. ^ Wyckoff RWG; Posnjak E (1921). "The Crystal Structure of Ammonium Chloroplatinate". J. Am. Chem. Soc. 43 (11): 2292. doi:10.1021/ja01444a002. ^ a b Bragg WH (1921). "The structure of organic crystals". Proc. R. Soc. Lond. 34: 33. Bibcode:1921PPSL...34...33B. doi:10.1088/1478-7814/34/1/306. ^ Lonsdale K (1928). "The structure of the benzene ring". Nature. 122 (3082): 810. Bibcode:1928Natur.122..810L. doi:10.1038/122810c0. ^ Pauling L. The Nature of the Chemical Bond (3rd ed.). Ithaca, NY: Cornell University Press. ISBN 0-8014-0333-2. ^ Bragg WH (1922). "The crystalline structure of anthracene". Proc. R. Soc. Lond. 35: 167. Bibcode:1922PPSL...35..167B. doi:10.1088/1478-7814/35/1/320. ^ Powell HM; Ewens RVG (1939). "The crystal structure of iron enneacarbonyl". J. Chem. Soc. : 286. doi:10.1039/jr9390000286. ^ Bertrand JA, Cotton, Dollase (1963). "The Metal-Metal Bonded, Polynuclear Complex Anion in CsReCl4". J. Am. Chem. Soc. 85 (9): 1349. doi:10.1021/ja00892a029. ^ Robinson WT; Fergusson JE; Penfold BR (1963). "Configuration of Anion in CsReCl4". Proceedings of the Chemical Society of London: 116. ^ Cotton FA, Curtis, Harris, Johnson, Lippard, Mague, Robinson, Wood (1964). "Mononuclear and Polynuclear Chemistry of Rhenium (III): Its Pronounced Homophilicity". Science. 145 (3638): 1305–7. Bibcode:1964Sci...145.1305C. doi:10.1126/science.145.3638.1305. PMID 17802015. ^ Cotton FA, Harris (1965). "The Crystal and Molecular Structure of Dipotassium Octachlorodirhenate(III) Dihydrate". Inorganic Chemistry. 4 (3): 330. doi:10.1021/ic50025a015. ^ Cotton FA (1965). "Metal-Metal Bonding in [Re2X8]2− Ions and Other Metal Atom Clusters". Inorganic Chemistry. 4 (3): 334. doi:10.1021/ic50025a016. ^ Eberhardt WH; Crawford W Jr.; Lipscomb WN (1954). "The valence structure of the boron hydrides". J. Chem. Phys. 22 (6): 989. Bibcode:1954JChPh..22..989E. doi:10.1063/1.1740320. ^ Martin TW; Derewenda ZS (1999). "The name is Bond—H bond". Nature Structural Biology. 6 (5): 403–6. doi:10.1038/8195. PMID 10331860. ^ Dunitz JD; Orgel LE; Rich A (1956). "The crystal structure of ferrocene". Acta Crystallographica. 9 (4): 373. doi:10.1107/S0365110X56001091. ^ Seiler P; Dunitz JD (1979). "A new interpretation of the disordered crystal structure of ferrocene". Acta Crystallographica B. 35 (5): 1068. doi:10.1107/S0567740879005598. ^ Wunderlich JA; Mellor DP (1954). "A note on the crystal structure of Zeise's salt". Acta Crystallographica. 7: 130. doi:10.1107/S0365110X5400028X. ^ Jarvis JAJ; Kilbourn BT; Owston PG (1970). "A re-determination of the crystal and molecular structure of Zeise's salt, KPtCl3.C2H4.H2O. A correction". Acta Crystallographica B. 26 (6): 876. doi:10.1107/S056774087000328X. ^ Jarvis JAJ; Kilbourn BT; Owston PG (1971). "A re-determination of the crystal and molecular structure of Zeise's salt, KPtCl3.C2H4.H2O". Acta Crystallographica B. 27 (2): 366. doi:10.1107/S0567740871002231. ^ Love RA; Koetzle TF; Williams GJB; Andrews LC; Bau R (1975). "Neutron diffraction study of the structure of Zeise's salt, KPtCl3(C2H4).H2O". Inorganic Chemistry. 14 (11): 2653. doi:10.1021/ic50153a012. ^ Westgren A; Phragmén G (1925). "X-ray Analysis of the Cu-Zn, Ag-Zn and Au-Zn Alloys". Phil. Mag. 50: 311. ^ Bradley AJ; Thewlis J (1926). "The structure of γ-Brass". Proc. R. Soc. Lond. 112 (762): 678. Bibcode:1926RSPSA.112..678B. doi:10.1098/rspa.1926.0134. ^ Hume-Rothery W (1926). "Researches on the Nature, Properties and Conditions of Formation of Intermetallic Compounds (with special Reference to certain Compounds of Tin)". Journal of the Institute of Metals. 35: 295. ^ Bradley AJ; Gregory CH (1927). "The Structure of certain Ternary Alloys". Nature. 120 (3027): 678. Bibcode:1927Natur.120..678.. doi:10.1038/120678a0. ^ Westgren A (1932). "Zur Chemie der Legierungen". Angewandte Chemie. 45 (2): 33. doi:10.1002/ange.19320450202. ^ Bernal JD (1935). "The Electron Theory of Metals". Annual Reports on the Progress of Chemistry. 32: 181. ^ Pauling L (1923). "The Crystal Structure of Magnesium Stannide". J. Am. Chem. Soc. 45 (12): 2777. doi:10.1021/ja01665a001. ^ Pauling L (1929). "The Principles Determining the Structure of Complex Ionic Crystals". J. Am. Chem. Soc. 51 (4): 1010. doi:10.1021/ja01379a006. ^ Dickinson RG; Raymond AL (1923). "The Crystal Structure of Hexamethylene-Tetramine". J. Am. Chem. Soc. 45: 22. doi:10.1021/ja01654a003. ^ Müller A (1923). "The X-ray Investigation of Fatty Acids". Journal of the Chemical Society (London). 123: 2043. doi:10.1039/ct9232302043. ^ Saville WB; Shearer G (1925). "An X-ray Investigation of Saturated Aliphatic Ketones". Journal of the Chemical Society (London). 127: 591. doi:10.1039/ct9252700591. ^ Bragg WH (1925). "The Investigation of thin Films by Means of X-rays". Nature. 115 (2886): 266. Bibcode:1925Natur.115..266B. doi:10.1038/115266a0. ^ de Broglie M, Trillat JJ (1925). "Sur l'interprétation physique des spectres X d'acides gras". Comptes rendus hebdomadaires des séances de l'Académie des sciences. 180: 1485. ^ Trillat JJ (1926). "Rayons X et Composeés organiques à longe chaine. Recherches spectrographiques sue leurs structures et leurs orientations". Annales de Physique. 6: 5. ^ Caspari WA (1928). "Crystallography of the Aliphatic Dicarboxylic Acids". Journal of the Chemical Society (London). ? : 3235. doi:10.1039/jr9280003235. ^ Müller A (1928). "X-ray Investigation of Long Chain Compounds (n. Hydrocarbons)". Proc. R. Soc. Lond. 120 (785): 437. Bibcode:1928RSPSA.120..437M. doi:10.1098/rspa.1928.0158. ^ Piper SH (1929). "Some Examples of Information Obtainable from the long Spacings of Fatty Acids". Transactions of the Faraday Society. 25: 348. doi:10.1039/tf9292500348. ^ Müller A (1929). "The Connection between the Zig-Zag Structure of the Hydrocarbon Chain and the Alternation in the Properties of Odd and Even Numbered Chain Compounds". Proc. R. Soc. Lond. 124 (794): 317. Bibcode:1929RSPSA.124..317M. doi:10.1098/rspa.1929.0117. ^ Robertson JM (1936). "An X-ray Study of the Phthalocyanines, Part II". Journal of the Chemical Society: 1195. ^ Crowfoot Hodgkin D (1935). "X-ray Single Crystal Photographs of Insulin". Nature. 135 (3415): 591. Bibcode:1935Natur.135..591C. doi:10.1038/135591a0. ^ Kendrew J. C., et al. (1958-03-08). "A Three-Dimensional Model of the Myoglobin Molecule Obtained by X-Ray Analysis". Nature. 181 (4610): 662–6. Bibcode:1958Natur.181..662K. doi:10.1038/181662a0. PMID 13517261. ^ "The Nobel Prize in Chemistry 1962". www.nobelprize.org. Retrieved 2018-01-31. ^ "Table of entries in the PDB, arranged by experimental method". ^ "PDB Statistics". RCSB Protein Data Bank. Retrieved 2010-02-09. ^ Scapin G (2006). "Structural biology and drug discovery". Curr. Pharm. Des. 12 (17): 2087–97. doi:10.2174/138161206777585201. PMID 16796557. ^ Lundstrom K (2006). "Structural genomics for membrane proteins". Cell. Mol. Life Sci. 63 (22): 2597–607. doi:10.1007/s00018-006-6252-y. PMID 17013556. ^ Lundstrom K (2004). "Structural genomics on membrane proteins: mini review". Comb. Chem. High Throughput Screen. 7 (5): 431–9. doi:10.2174/1386207043328634. PMID 15320710. ^ "Cryogenic (<20 K) helium cooling mitigates radiation damage to protein crystals". Acta Crystallographica D. 63 (4): 486–492. 2007. doi:10.1107/s0907444907005264. ^ Claydon, J.; Greeves, N.; Warren, S. (2012). Organic Chemistry (PDF) (2nd ed.). Oxford University Press. p. 45. ISBN 0199270295. ^ Suryanarayana, C.; Norton, M. Grant (2013-06-29). X-Ray Diffraction: A Practical Approach. Springer Science & Business Media. ISBN 9781489901484. ^ Greilinger, Alden B (1935). "A Back-Reflection Laue Method for determining Crystal Orientation". Zeitschrift für Kristallographie - Crystalline Materials. 91. doi:10.1524/zkri.1935.91.1.424. ^ "Morphology XRD Analysis | IMR TEST LABS". www.imrtest.com. Retrieved 2018-04-30. ^ Jones, Nicola (2014-01-29). "Crystallography: Atomic secrets". Nature. 505 (7485): 602–603. Bibcode:2014Natur.505..602J. doi:10.1038/505602a. ^ Miao, Jianwei; Charalambous, Pambos; Kirz, Janos; Sayre, David (1999). "Extending the methodology of X-ray crystallography to allow imaging of micrometre-sized non-crystalline specimens". Nature. 400 (6742): 342. Bibcode:1999Natur.400..342M. doi:10.1038/22498. ^ Harp, JM; Timm, DE; Bunick, GJ (1998). "Macromolecular crystal annealing: overcoming increased mosaicity associated with cryocrystallography". Acta Crystallographica D. 54 (Pt 4): 622–8. doi:10.1107/S0907444997019008. PMID 9761858. ^ Harp, JM; Hanson, BL; Timm, DE; Bunick, GJ (1999). "Macromolecular crystal annealing: evaluation of techniques and variables". 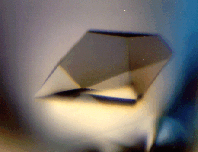 Acta Crystallographica D. 55 (Pt 7): 1329–34. doi:10.1107/S0907444999005442. PMID 10393299. ^ Hanson, BL; Harp, JM; Bunick, GJ (2003). "The well-tempered protein crystal: annealing macromolecular crystals". Methods in Enzymology. Methods in Enzymology. 368: 217–35. doi:10.1016/S0076-6879(03)68012-2. ISBN 978-0-12-182271-2. PMID 14674276. ^ Geerlof A, et al. (2006). "The impact of protein characterization in structural proteomics". Acta Crystallographica D. 62 (Pt 10): 1125–36. doi:10.1107/S0907444906030307. PMID 17001090. ^ Chernov AA (2003). "Protein crystals and their growth". J. Struct. Biol. 142 (1): 3–21. doi:10.1016/S1047-8477(03)00034-0. PMID 12718915. ^ Chayen, Naomi. "Limitations of crystallizing under oil". www.cell.com. Retrieved 2 April 2019. ^ Rupp B; Wang J (2004). "Predictive models for protein crystallization". Methods. 34 (3): 390–407. doi:10.1016/j.ymeth.2004.03.031. PMID 15325656. ^ Chayen NE (2005). "Methods for separating nucleation and growth in protein crystallization". Prog. Biophys. Mol. Biol. 88 (3): 329–37. doi:10.1016/j.pbiomolbio.2004.07.007. PMID 15652248. ^ Stock D; Perisic O; Lowe J (2005). "Robotic nanolitre protein crystallisation at the MRC Laboratory of Molecular Biology". Prog Biophys Mol Biol. 88 (3): 311–27. doi:10.1016/j.pbiomolbio.2004.07.009. PMID 15652247. ^ Jeruzalmi D (2006). "First analysis of macromolecular crystals: biochemistry and x-ray diffraction". Methods Mol. Biol. 364: 43–62. doi:10.1385/1-59745-266-1:43. ISBN 1-59745-266-1. PMID 17172760. ^ Helliwell JR (2005). "Protein crystal perfection and its application". Acta Crystallographica D. 61 (Pt 6): 793–8. doi:10.1107/S0907444905001368. PMID 15930642. ^ Vandenberg JM, Temkin H, Hamm RA, DiGiuseppe MA (1982). "Structural study of alloyed gold metallization contacts on InGaAsP/InP layers". Journal of Applied Physics. 53 (11): 7385–7389. Bibcode:1982JAP....53.7385V. doi:10.1063/1.330364. ^ Vandenberg JM, Temkin H (1984). "An in situ x‐ray study of gold/barrier‐metal interactions with InGaAsP/InP layers". Journal of Applied Physics. 55 (10): 3676–3681. Bibcode:1984JAP....55.3676V. doi:10.1063/1.332918. ^ Garman, E. F.; Schneider, T. R. (1997). "Macromolecular Cryocrystallography". Journal of Applied Crystallography. 30 (3): 211. doi:10.1107/S0021889897002677. ^ Schlichting, I; Miao, J (2012). "Emerging opportunities in structural biology with X-ray free-electron lasers". Current Opinion in Structural Biology. 22 (5): 613–26. doi:10.1016/j.sbi.2012.07.015. PMC 3495068. PMID 22922042. ^ Neutze, R; Wouts, R; Van Der Spoel, D; Weckert, E; Hajdu, J (2000). "Potential for biomolecular imaging with femtosecond X-ray pulses". Nature. 406 (6797): 752–7. Bibcode:2000Natur.406..752N. doi:10.1038/35021099. PMID 10963603. ^ Liu, W; Wacker, D; Gati, C; Han, G. W.; James, D; Wang, D; Nelson, G; Weierstall, U; Katritch, V; Barty, A; Zatsepin, N. A.; Li, D; Messerschmidt, M; Boutet, S; Williams, G. J.; Koglin, J. E.; Seibert, M. M.; Wang, C; Shah, S. T.; Basu, S; Fromme, R; Kupitz, C; Rendek, K. N.; Grotjohann, I; Fromme, P; Kirian, R. A.; Beyerlein, K. R.; White, T. A.; Chapman, H. N.; et al. (2013). "Serial femtosecond crystallography of G protein-coupled receptors". Science. 342 (6165): 1521–4. Bibcode:2013Sci...342.1521L. doi:10.1126/science.1244142. PMC 3902108. PMID 24357322. ^ Ravelli RB; Garman EF (2006). "Radiation damage in macromolecular cryocrystallography". Curr. Opin. Struct. Biol. 16 (5): 624–9. doi:10.1016/j.sbi.2006.08.001. PMID 16938450. ^ Powell HR (1999). "The Rossmann Fourier autoindexing algorithm in MOSFLM". Acta Crystallographica D. 55 (Pt 10): 1690–5. doi:10.1107/S0907444999009506. PMID 10531518. ^ Hauptman H (1997). "Phasing methods for protein crystallography". Curr. Opin. Struct. Biol. 7 (5): 672–80. doi:10.1016/S0959-440X(97)80077-2. PMID 9345626. ^ Usón I; Sheldrick GM (1999). "Advances in direct methods for protein crystallography". Curr. Opin. Struct. Biol. 9 (5): 643–8. doi:10.1016/S0959-440X(99)00020-2. PMID 10508770. ^ a b Taylor G (2003). "The phase problem". Acta Crystallographica D. 59 (11): 1881. doi:10.1107/S0907444903017815. ^ Ealick SE (2000). "Advances in multiple wavelength anomalous diffraction crystallography". Current Opinion in Chemical Biology. 4 (5): 495–9. doi:10.1016/S1367-5931(00)00122-8. PMID 11006535. 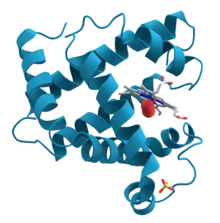 ^ From PDB file 2NRL, residues 17–32. ^ Rietveld, H. M. (1969-06-02). "A profile refinement method for nuclear and magnetic structures". Journal of Applied Crystallography. 2 (2): 65–71. doi:10.1107/S0021889869006558. ^ The Rietveld method. Young, R. A. (Robert Alan), 1921-. [Chester, England]: International Union of Crystallograhy. 1993. ISBN 0198555776. OCLC 26299196. ^ "IUCr". www.iucr.org. Retrieved 2019-04-06. ^ "Fullprof". www.ill.eu. Retrieved 2019-04-06. ^ Petříček, Václav; Dušek, Michal; Palatinus, Lukáš (2014-01-01). "Crystallographic Computing System JANA2006: General features". Zeitschrift für Kristallographie - Crystalline Materials. 229 (5). doi:10.1515/zkri-2014-1737. ISSN 2196-7105. ^ Lutterotti, Luca (February 2010). "Total pattern fitting for the combined size–strain–stress–texture determination in thin film diffraction". Nuclear Instruments and Methods in Physics Research Section B: Beam Interactions with Materials and Atoms. 268 (3–4): 334–340. doi:10.1016/j.nimb.2009.09.053. ISSN 0168-583X. ^ Lutterotti, L.; Matthies, S.; Wenk, H.-R.; Schultz, A. S.; Richardson, J. W. (1997-01-15). "Combined texture and structure analysis of deformed limestone from time-of-flight neutron diffraction spectra". Journal of Applied Physics. 81 (2): 594–600. doi:10.1063/1.364220. ISSN 0021-8979. ^ "Distribution Files for the RIETAN-FP-VENUS Package". fujioizumi.verse.jp. Retrieved 2019-04-06. ^ Toby, Brian H.; Von Dreele, Robert B. (2013-03-14). "GSAS-II: the genesis of a modern open-source all purpose crystallography software package". Journal of Applied Crystallography. 46 (2): 544–549. doi:10.1107/s0021889813003531. ISSN 0021-8898. ^ "DIFFRAC.SUITE TOPAS - XRD Software, X-ray diffraction". Bruker.com. Retrieved 2019-04-06. ^ "Match! - Phase Identification from Powder Diffraction". www.crystalimpact.com. Retrieved 2019-04-06. ^ Casas-Cabanas, Montse; Reynaud, Marine; Rikarte, Jokin; Horbach, Pavel; Rodríguez-Carvajal, Juan (2016-12-01). "FAULTS : a program for refinement of structures with extended defects". Journal of Applied Crystallography. 49 (6): 2259–2269. doi:10.1107/S1600576716014473. ISSN 1600-5767. ^ Patterson A. L. (1935). "A Direct Method for the Determination of the Components of Interatomic Distances in Crystals". Zeitschrift für Kristallographie. 90: 517. doi:10.1524/zkri.1935.90.1.517. ^ "The Nobel Prize in Physics 1914". Nobel Foundation. Retrieved 2008-10-09. ^ a b "The Nobel Prize in Physics 1915". Nobel Foundation. Retrieved 2008-10-09. ^ a b "The Nobel Prize in Chemistry 1962". Nobelprize.org. Retrieved 2008-10-06. ^ a b c "The Nobel Prize in Physiology or Medicine 1962". Nobel Foundation. Retrieved 2007-07-28. ^ "The Nobel Prize in Chemistry 1964". Nobelprize.org. Retrieved 2008-10-06. ^ a b "The Nobel Prize in Chemistry 1972". Nobelprize.org. Retrieved 2008-10-06. ^ "The Nobel Prize in Chemistry 1976". Nobelprize.org. Retrieved 2008-10-06. ^ a b "The Nobel Prize in Chemistry 1985". Nobelprize.org. Retrieved 2008-10-06. ^ a b c "The Nobel Prize in Chemistry 1988". Nobelprize.org. Retrieved 2008-10-06. ^ "The Nobel Prize in Chemistry 1997". Nobelprize.org. Retrieved 2008-10-06. ^ a b "The Nobel Prize in Chemistry 2003". Nobelprize.org. Retrieved 2008-10-06. ^ "The Nobel Prize in Chemistry 2006". Nobelprize.org. Retrieved 2008-10-06. ^ a b c "The Nobel Prize in Chemistry 2009". Nobelprize.org. Retrieved 2009-10-07. ^ "The Nobel Prize in Chemistry 2012". Nobelprize.org. Retrieved 2012-10-13. ^ Max von Laue (1937). Laue Diagrams. Bangalore Press. p. 9. ^ France, André Authier, Institut de Minéralogie et de Physique des Milieux Condensés, Université P. et M. Curie, Paris, (2013). Early days of X-ray crystallography (First ed.). Oxford: Oxford University Press. pp. 1–8. ISBN 9780199659845. ^ Thangadurai, S; Abraham, JT; Srivastava, AK; Moorthy, MN; Shukla, SK; Anjaneyulu, Y (July 2005). "X-ray powder diffraction patterns for certain beta-lactam, tetracycline and macrolide antibiotic drugs". Analytical sciences : the international journal of the Japan Society for Analytical Chemistry. 21 (7): 833–838. doi:10.2116/analsci.21.833. PMID 16038505. ^ Rendle, David (2005). "Advances in chemistry applied to forensic science". Chem. Soc. Rev. 34 (12): 1021–1030. doi:10.1039/b415890n. ^ Svarcová, S; Kocí, E; Bezdicka, P; Hradil, D; Hradilová, J (September 2010). "Evaluation of laboratory powder X-ray micro-diffraction for applications in the fields of cultural heritage and forensic science". Analytical and Bioanalytical Chemistry. 398 (2): 1061–76. doi:10.1007/s00216-010-3980-5. PMID 20640895. ^ Hiller, JC; Thompson, TJ; Evison, MP; Chamberlain, AT; Wess, TJ (December 2003). "Bone mineral change during experimental heating: an X-ray scattering investigation". Biomaterials. 24 (28): 5091–7. doi:10.1016/s0142-9612(03)00427-7. PMID 14568425. ^ Courtland, Rachel (17 March 2017). "X-rays Map the 3D Interior of Integrated Circuits". IEEE Spectrum: Technology, Engineering, and Science News. Retrieved 27 January 2018. Bijvoet JM, Burgers WG, Hägg G, eds. (1972). 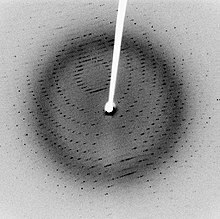 Early Papers on Diffraction of X-rays by Crystals. II. Utrecht: published for the International Union of Crystallography by A. Oosthoek's Uitgeversmaatschappij N.V.